A great example of the full range of material that Portland Precision machines, from copper, to Titanium and a Special Plastic called Ultem. 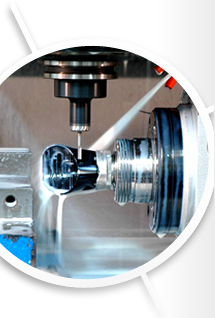 Portland Precision Manufacturing Company is the Pacific Northwest’s leading provider of CNC machining and manufacturing. Our precision machining expertise enables us to produce parts and components from a wide range of materials, all with the same high levels of quality and accuracy. From prototype manufacturing through full production runs with quantities in the thousands, Portland Precision can deliver the tight tolerance parts you need in the materials your application requires. We work with aluminum in all grades and alloys to meet your unique specifications. With our aluminum CNC machining capabilities, we can provide precision parts with tolerances of ±0.0005” or better. We also provide anodizing and other secondary operations to give you precision machined aluminum parts that better match your design requirements. 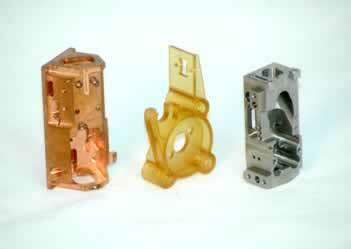 Portland Precision provides high precision CNC machining for standard and exotic plastic materials. We work with everyday plastics as well as specialized engineered plastics that other machining companies can’t or won’t touch. In-house annealing capabilities help maintain the stability of machined plastics for greater precision. From common 300 Series and 400 Series stainless steel to specialty grades like 15-5 pH and 17-4 pH, we work with all grades of stainless steel. Our advanced stainless steel machining capabilities enable us to maintain tight tolerances (±0.0005” or better) for even the most complex part shapes, and our CNC technology ensures perfect repeatability from the first piece to the last. We provide precision machining service for all titanium grades and alloys. This lightweight, exceptionally strong metal is popular for numerous applications—from medical to aerospace and beyond—and our precision titanium machining capabilities enable us to deliver complex, tight tolerance parts that match our customers’ unique design specifications. Most machine shops are incapable of machining tungsten, as it is extremely hard and notoriously difficult to machine. At Portland Precision, we have the knowhow and the technology to provide high precision tungsten CNC machining, with tolerances of ±0.0005” or tighter. We are the tungsten machining experts you need to get your job done right. The softness and malleability of copper make it difficult for many in our industry to work with. Fortunately, Portland Precision has many years of experience in machining copper, and can produce even the most complex parts and components with superior precision and repeatability. Our advanced copper CNC machining technology allows us to hold tolerances of ±0.0005” or better. Unlike copper, brass is a relatively easy material to machine, and no one does it better than Portland Precision. Our skills and experience in brass machining enable us to deliver tight tolerance parts and components that match our customers’ exact design requirements, no matter how simple or complex the geometry may be. One of the most commonly-used specialty plastics, Ultem is popular for medical, aerospace, and other demanding applications. Our Ultem CNC machining capabilities enable us to deliver high precision parts with tight tolerances (±0.0005” or better). An in-house annealing oven helps us maintain the stability of Ultem during machining to ensure part quality. No matter what material your application demands, Portland Precision has the skills and experience to deliver precision machined parts and components that match your exact requirements. Request a quote or contact us to get us started on your next project.